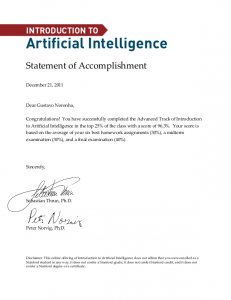 One of my side projects for these last months was to enroll on the online Introduction to AI class, with Peter Norvig and Sebastian Thrun, professors at Stanford. Through it I also learned about the Kahn Academy. I must say that getting to know these efforts made me feel similar to when I found Free Software: it’s hard to believe that such great things exist! I learned some really cool stuff, and was also introduced to the amazing work of Sebastian Thrun with self-driving cars, it was an awesome experience! 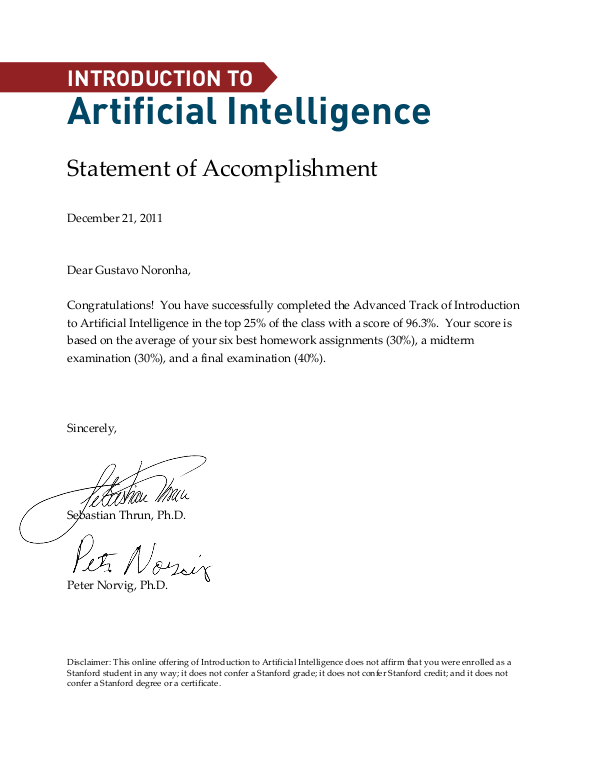 Last weekend I took the final exam, and today I got the certificate of accomplishment. It was delivered as a signed PDF which can be checked with a certificate they provided, pretty neat. I’m very happy, and motivated to enroll on more such courses in the future =). Now it’s time to cool down, though. My vacations start today, and on the weekend I’ll travel to the sunny Fortaleza, in northeastern Brazil, to enjoy some nice beaches and get some tan. See you next year! For a while now my fellow Collaboran Joone Hur has been working on implementing the Accelerated Compositing infrastructure available in WebKit in webkit-clutter, so that we can use Clutter’s powers for compositing separate layers and perform animations. This work is being done by Collabora and is sponsored by BOSCH, whom I’d like to thank! What does all this mean, you ask? Let me tell me a bit about it. The way animations usually work in WebKit is by repainting parts of the page every few milliseconds. What that means in technical terms is that an area of the page gets invalidated, and since the whole page is one big image, all of the pieces that are in that part of the page have to be repainted: the background, any divs, images, text that are at that part of the page. What the accelerated compositing code paths allow is the creation of separate pieces to represent some of the layers, allowing the composition to happen on the GPU, removing the need to perform lots of cairo paint operations per second in many cases. So if we have a semi-transparent video moving around the page, we can have that video be a separate texture that is layered on top of the page, made transparent and animated by the GPU. In webkit-clutter’s case this is done by having separate actors for each of the layers. I have been looking at this code on and off, and recently joined Joone in the implementation of some of the pieces. The accelerated compositing infrastructure was originally built by Apple and is, for that reason, works in a way that is very similar to Core Animation. The code is still a bit over the place as we work on figuring out how to best translate the concepts into clutter concepts and there are several bugs, but some cool demos are already possible! Bellow you have one of the CSS3 demos that were made by Apple to demo this new functionality running on our MxLauncher test browser. You can also see that the non-Accelerated version is unable to represent the 3D space correctly. Also, can you guess which of the two MxLauncher instances is spending less CPU? 😉 In this second video I show the debug borders being painted around the actors that were created to represent layers. We still have plenty of work to do, so expect to hear more about it. During our annual hackfest in A Coruña we plan to discuss how this work could be integrated also in the WebKitGTK+ port, perhaps by taking advantage of clutter-gtk, which would benefit both ports, by sharing code and maintenance, and providing this great functionality to Epiphany users. Stay tuned! You know, GNOME Shell and I are not really strangers to each other for a long time now. I have been using it almost daily as my main desktop since late 2009, when I started shipping it to Debian experimental. That means that I had ample opportunity to both get used to it and witness the huge improvements it had with every new release. My general feeling towards GNOME 3 is this: ♥. Yes, I love it! I love the new themes, I love the window borders, I love the top panel, the overview, the dynamic workspaces, I love the Me menu, I love the clock and the calendar, the system indicators with the beautiful symbolic icons, being able to search for applications in such a nice way, the window animations, the multi-screen support, the new nautilus, the dash, looking glass. It’s hard for me to even express how thankful I am and how much admiration I have for the awesome folks who helped bring this to life. Thanks so much! After all this time, there are only two things I can say I dislike about GNOME3, apart from some minor wishlists: the alt-tab behaviour and the message tray. Let me expand on those. Of the very few things I dislike, there is only 1 I hate and cannot see myself living with: the accordion animation in the message tray. No, really, it’s such a terrible, terrible idea. Every single time I try to use that thing I overshoot while moving the mouse to the left, then overshoot again moving the mouse to the right because the frigging icon has moved. It’s no good knowing that I can click in the text or in the empty area to its right, it feels wrong. It’s terrible that my actual target is moving at all. Every single time I use it is a small frustration for me – it’s as if the message tray was playing games with me, laughing at me for not having good enough mouse pointer driving skills – even more than the infamous sub-menus used to. And I had to go through that penance whenever I wanted to find the person I was chating with to resume the conversation. I wrote an extension that disables the accordion animation by simply not showing the title at all when you hover the icon, and I patched GNOME Shell’s CSS to make the icons a bit bigger, so that it’s easier for me to hit them with the mouse. It’s clearly not ideal, and you still have to click the various “people” icons to figure out which of your friends who were lazy enough to not add a picture to their IM profiles is that one, but it’s still much better than chasing the (smaller) ones around to figure that out. Perhaps we should have the icons be bigger and always have the title bellow them? I don’t know, I trust the awesome designers who designed the awesomess that’s everywhere else will come up with a great idea. My message tray with bigger icons and no accordion animation. The number 1 feature of workspaces for me has always been locality – being able to not see all of the other applications and windows that are open elsewhere. This lowers the amount of noise when I’m trying to find something. The overview is very nice in this matter – only windows in the current workspace are shown, and even when you have an extra screen, the windows in there appear in that screen. The alt-tab behaviour, on the other hand, of showing all windows and apps, even with the separator, bothers me. It’s really useful to have when you want to go to a specific window no matter where it is (I usually use the dash for that, though), but it adds noise when you want to go to a specific window _in this_ workspace, which is the most common use case for my usage. So I copied the alt-tab code over to an extension and modified it so that only windows in the current workspace would be considered. In addition to that, with the windows in the extra screen always being there no matter what workspace you’re in (which I think is an awesome idea), they are effectively in all workspaces, so they add constant noise even with my extension. It’s also weird to have to look at the main screen to switch to a window in the extra screen. There’s a huge discontinuity. What I would prefer is having alt-tab to follow the mouse regarding screens – only show windows in the extra screen if you hit alt-tab in there, making sure the selector thing appears in there as well. In case you missed the news on webkit-dev, Collabora has been working on developing a clutter port of WebKit. It shares the build system with EFL, and most of the backend code comes from the GTK+ port. That means networking is handled by soup, drawing by cairo, multimedia by GStreamer, and so on. The BUILD_MX_LIB option is optional – it will build what we call the “Mx toolkit library” in addition to the vanilla one. Then you can test that the library is built and working by running the programs inside the “Programs” directory. Enjoy! 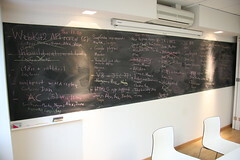 Last week I attended the WebKitGTK+ 2010 hackfest. It was a great opportunity to meet up with the other developers, discuss some plans for the future, hack away at WebKitGTK+. But, most importantly, play Street Figher 2 =). Thanks to Collabora and Igalia for sponsoring the hackfest, Igalia for hosting and organizing it (well done! 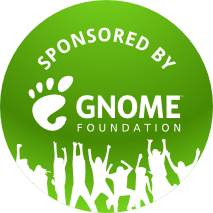 ), and the GNOME foundation for having sponsored my trip to Coruña! Unlike last year we didn’t find any big design issues hurting our work (page cache, I’m looking at you!) on new futures. I also didn’t have any huge plans for new API, although we did manage to get some new stuff in there, like the plugins management API Xan created, and the further work done by Dan in soup. This meant, from my point of view the hackfest has been a great oportunity to look at refactorings that we could do to further simplify understanding the code, changing it, and even sharing it =). Besides pushing the debian packaging of the 1.3.x series a bit further. Wouldn’t it be nice if Google practiced what they preach? Update: so it looks like my message went through to the people who needed to see it, and they found a filtering error in the User Agent sniffing code that made it think Epiphany was a too old Safari – I’m told the change will land in Youtube soon, thanks for those paying attention, and working on this! User Agent sniffing keeps being a problem, of course, and there are other stuff to fix, so I will probably still push my patch to spoof the user agent to google services which are still mishandling Epiphany, but it’s good to see some progress being made! When I started working on WebKitGTK+ I was a web developer, writing IT applications using Python and Django, and building features for content portals running Plone (argh). Even though I was an Epiphany user ever since it was forked off Galeon, I still had to use Firefox for my work, because I couldn’t really live without Firebug. It should come as no surprise, then, that one of my first patches to WebKitGTK+ was actually making the awesome Web Inspector work in our port. After the initial support, though, not a lot has been done to further improve it, partly because it was already good enough for many uses, partly because I somehow started doing non-web development again ;). These last weeks, through my R&D efforts in Collabora, I have been able to push Web Inspector features and integration a bit further. A simple change that boosts the Inspector’s usability quite a bit is having the nodes that are being hovered highlighted. Along with that, the ability to attach the inspector to Epiphany’s window should make it easier to use for poking the DOM. WebKitGTK+ 1.2.2 and 1.2.3 released! Some of you may have noticed WebKitGTK+ 1.2.2 and 1.2.3 have been uploaded recently. Here’s their announcement =). A quick summary: if you’re running the 1.2.x series upgrade to 1.2.3.
because it’s simple and will help with fixing a problem in Epiphany stable, and 2) lots of drag and drop, and clipboard related work by Martin Robinson. Despite not being strictly fixes, we believe the stable series has a lot to gain from this work; a couple examples should illustrate this better: the changes included fix both a crash when dragging links from WebKit into other browsers, and the annoying bug that made the cursor get stuck in a grab when dragging, sometimes. To some such a quick succession in releases may look like a brown paper bag was in order. Not strictly, but indeed 1.2.3 aims to fix some oversights with easy fixes. First of all, WebKit was not buildable with ICU 4.4.1, but thankfully a fix had already been checked in to trunk, so 1.2.3 includes that fix. Secondly, Debian’s Michael Gilbert has done a great job going through all CVEs released about WebKit, and including patches in the Debian package. 1.2.3 includes all of the commits from trunk to fix those, too.